It’s one of those questions that many of us might have in our heads, but never actually verbalise. After all, it sounds rude, doesn’t it? As if we’re questioning someone’s life choices – something we know never, ever to do in 21st-century Britain. Well, here’s an answer. It’s my answer, and it may not be everyone’s, but here it is. If you’d asked me in October 2011, when I was sat up in the night feeding our newborn, reading post after post on my friend’s adoption blog, I may have said something about God pulling on my heart strings in a way that He hadn’t previously. 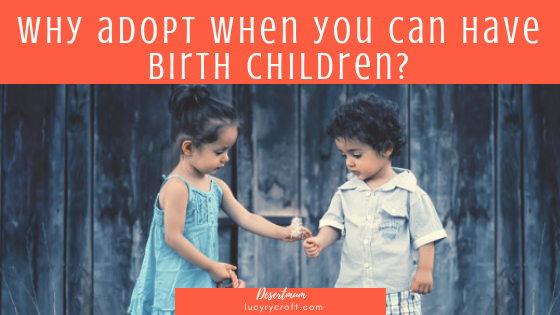 Surely the conversion of “I’d rather not adopt…unless we have to” into “I’m desperate to adopt – how much longer do we have to wait?” is answer enough. You see, we were never making the decision between adoption and the usual route. We hadn’t had a serious discussion about whether to go for a third child or not – in our off-the-cuff comments to one another it was possible that I was keen and he was not, but I think now that God protected us from getting deep into these conversations, so that we might consider adoption on its own merits, and not as an alternative to having a birth child. If you’d asked me in April 2015, when we attended an adoption preparation course, I’d have struggled to answer. Here we were, sat in a room full of those who couldn’t have children – heterosexual couples let down by the crueller side of nature, and homosexual couples who had limited options for having a family – knowing that, to the best of our knowledge, the equipment we possessed for bringing a new life into the world was still fully-operational. Why were we here? It’s a question I blurted out to my social worker once the course was over. I wasn’t thinking of pulling out – more playing Devil’s Advocate, challenging this experienced professional to tell us, like some competitive reality TV show, why we should remain in the process. Her answer was wise and insightful, and we’ve quoted it many times in conversation with others. It’s all about the child, she said. He needs to find the right family for him. The more families who enter the pool, the better the chances for the child. And that was it. A complete reversal of the adoption process. She’d reminded us that we weren’t in this for us, as if we simply wanted to make our family more quirky, or gain new blog followers. We were in it for him or her or them – whoever God might have, ready and waiting, who needed our family. Later, we were to call one of our boys “God has remembered”. (Not literally, of course, we’re not that quirky – but a name which means that. Being a public blog and all, I’m not about to share the actual name with you but if you enjoy that kind of thing then by all means look it up.) The point is that our boys were not forgotten. They were not forgotten when they were parted from birth family and they were not forgotten when they were being cared for by their foster family. God remembered them. And, if you were to ask me now, April 2018, when our boys have been with us for well over two years, and the reality of our blended family has become normal and everyday – what would I say? I would ask you what might have happened to our boys had we not entered the process. It’s highly likely that they would have gone to another family – they were young and cute enough to be a popular entry on the looked-after children register. This thought gives me huge relief on the one hand, to know that my boys would have been loved. But that’s just it. They’re my boys, and the thought of them being in anyone’s family other than ours is so inconceivable that it actually just feels wrong. 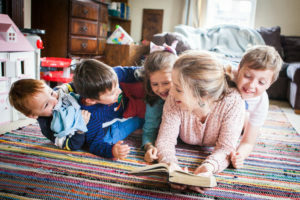 It shouldn’t matter whether you have birth children, step children, foster children or no children – if God (or your chosen deity) leads you down a path of adoption, go there without hesitation: you’ll discover rich treasures of love, belonging, identity and family that you never even knew existed. Love this blog post. We have 2 birth daughters and likewise are pursuing adoption not as a plan B, or as an alternative to having “our own kids” but because there are many children in need of a family and we can be that family. That’s fab Jessica! We know how that feels 🙂 My giveaway is open internationally, so do enter if you’d like to win a copy of this book – part one would make great reading prior to adopting, and part two would be great when you’re in the thick of it!